Naimisharanya is a sacred place that finds mention in various Hindu scriptures. It is of great importance in Hindu Religion. Puranas states that Saunaka Rishi and 80, 000 other stages performed a yajna here dedicated to Shiva and thus making it a sacred Tirth. The place of yajna was decided by Brahma. A chakra or disc that was thrown by Brahma landed at Naimisharanya. This holy spot is located in Uttar Pradesh. Naimisharanya is around 220 km northwest of Ayodhya. It is around 90 KM northwest of Lucknow and 34 KM from Hardoi. Haridwar is around 484 km north of Naimisharanya. Varanasi is around 406 km southeast of Naimisharanya. Naimisharanya is around 303 km south of Allahabad. When the Kali Yuga was about to begin, holy men and sages approached Brahma to suggest a place to stay during Kali Age – so that they won’t have to face the bad things of the era. The place that Brahma suggested was Naimisharanya. The area then was a forest named Naimisha. It is also believed that the Satyanarayana Katha was first recited here. Ved Vyasa composed some of the important Puranas here. It is believed that Vishnu appeared as Varaha Avatar (Boar) here. Suta, the student of Vyasa, first narrated the Mahabharata here. The place is mentioned in many Puranas especially Matsya and Varaha Purana. 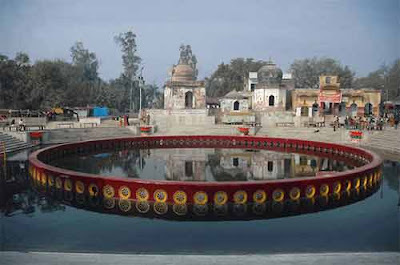 The most important holy place here is the Chakra Tirth – a holy pond. The spot that Brahma suggested to Saunaka Rishi to perform yajna. There are numerous other holy spots in and around Chakra Tirth – this includes Hanuman Garhi, Pandav Kila, Lalitha Devi Temple, Yvas Gadi and Havan Kund. The popular belief is that taking bath in the Chakra Trith is highly meritorious. Large number of people assemble here on Somavati Amavasya – No moon day on Monday. There are numerous accommodations available at Naimish. There are loads of accommodations available there. For the past 3 years, lots of constructions have happened and most of them at at the price range from Rs. 750/- to Rs 2000/- per day per room. One of the best places that I liked, in terms of cleanliness and facilities is accommodation by Sai Mandir. This is walking distance to Gomati river and Balaji Temple. The cost as of Oct, 2012 is Rs.250/- per day per room which includes free food.